The clubhouse at twilight. Photo courtesy of Mark Holland. This is the first in a series of three articles on the current plans and process to demolish the Jefferson Park Golf Clubhouse. 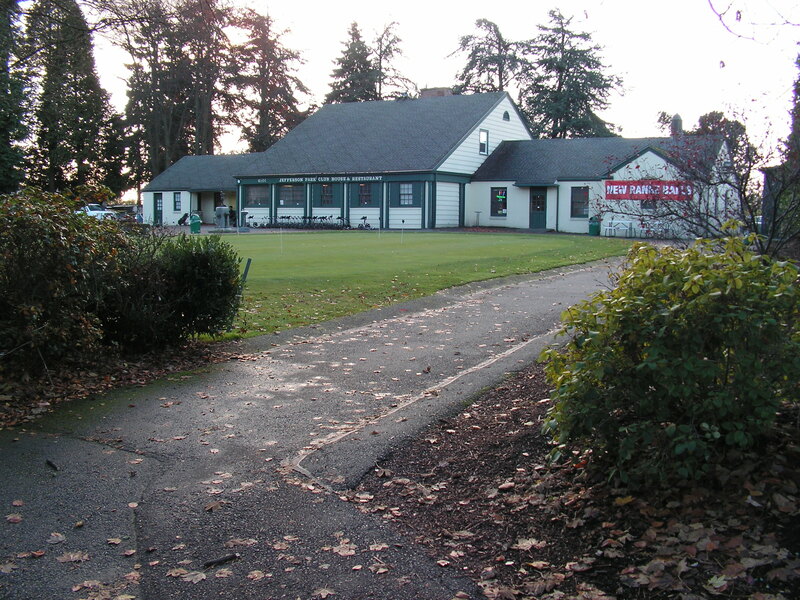 This fall, the Seattle Department of Parks and Recreation (DOPAR) plans to demolish the historic 1936 Jefferson Park Municipal Golf Course Clubhouse on Beacon Hill. DOPAR claims the Clubhouse is of no importance to Seattle history and culture. On February 15, 2012, a landmarks nomination for the Clubhouse was presented before the Seattle Landmarks Preservation Board. The author of the nomination is Bassetti Architects, hired by DOPAR to both prepare the landmarks nomination and to design the replacement facility. Bassetti was about 50% of the way through the new clubhouse/driving range design when DOPAR submitted the nomination to the Landmarks Preservation Board. The Historic Preservation Officer, Karen Gordon, head of the Landmarks Preservation Board staff, approved the nomination for submittal to the Board. 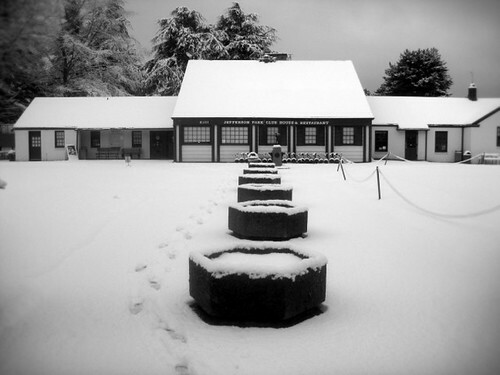 During their presentation, Bassetti Architects and the Parks Department diminished the historical and architectural aspects of the Clubhouse on all six standards in SMC 12.45.350, the Seattle Municipal Code which defines the standards for historic designation of buildings and sites in Seattle. The Landmarks Preservation Board chair noted that, according to the rules, they could only consider the contents of the nomination. The Board staff then recommended against approval of the nomination. The Board vote ended in a split; four in favor of approval and four against. Without a majority this meant the nomination failed: the history of the Jefferson Park Golf Clubhouse officially declared not “important” in the Landmarks Preservation Board archives. On August 9, 2012, the Department of Planning and Development (DPD) approved the Master Use Permit (MUP) application for concept approval and land use variances. All that DOPAR needs now is City Council “Concept Approval” of the new plan, as described in SMC 23.76.064. The Seattle City Council will vote either for or against “Concept Approval” for the Bassetti plan in a hearing before the Land Use Subcommittee chaired by Councilmember Richard Conlin on September 12, 2012. If the City Council approves the new design concept, the Golf Clubhouse and the century long history of the Jefferson Park Golf course will be tossed in the trash like yesterday’s newspaper. Meanwhile, just a few miles away, over at the West Seattle Golf course, it is a different story. 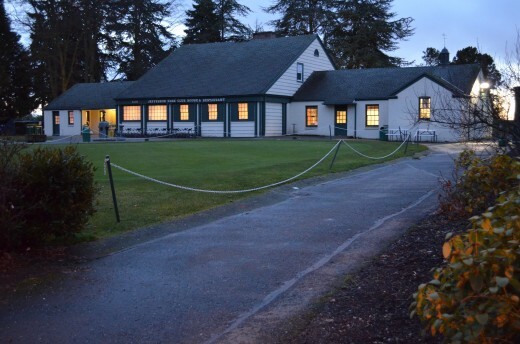 DOPAR will fully renovate the Clubhouse, and will not ruin the integrity of the historic golf course with a driving range: a project cancelled last year by Parks Superintendent Christopher Williams due to overwhelming public pressure. What exactly do DOPAR, Bassetti Architects, the Historic Preservation Officer, and four members of the Landmarks Preservation Board find so uninteresting about Jefferson Park Golf History? Coming up next: The vanishing history of Jefferson Park Golf, Part II: Dreamers and Builders. The Jefferson Park Golf Clubhouse looked cozy in last month's snow. Photo by Joel Lee in the Beacon Hill Blog photo pool on Flickr. The decision to demolish the Jefferson Park Golf Clubhouse to make way for a low-budget two-story driving range should consider a lot more than money. If money was the only issue of import, there would be no Pike Place Market. The Jefferson Park Golf Clubhouse is made out of very attractive 80-year-old probably locally-made fired red brick, and its wood components are traditionally-built assemblies, with actual tree wood in solid profiles we used to call lumber and mill work. Such things are still made, but only the very rich can afford them. Why would we throw something so valuable away? Just because some fool painted it and did a bunch of sloppy remodeling is no reason to throw it away. If we fix it and turn back the remodeling clock to 1936 in the process, we will have an architectural treasure: standing in the park largely made of the original materials which we could not hope to replace at any reasonable cost, looking wonderful, and reminding us that America was once a great nation populated with carpenters and masons who were skilled and principled craftsmen of a high order. We will walk through it and remember that it was in those rooms that Americans of every race met and socialized and shared a love of golf more than they valued the segregation that separated them everywhere else. We will be reminded of the power of our American social contract to create the WPA, to restore the American economy, and lift Americans out of the ditch that greed and unregulated capitalism had thrown us into. And we will be reminded of the care that was taken to invest beauty and quality into our public investments in the commons. If you seriously think today’s Parks department is up to matching that in new construction in 2012, please send me some of whatever you are smoking. Anything they build new and cheaper would be made out of glued-together wood flakes and cheesy cladding products made out of vinyl-skinned foamed plastic and sawdust cement slurry. The enclosure detailing would undoubtedly be the usual leaky hollow section, nail-on flange windows and pseudo-rainscreens we see being tented and repaired all over town. I see so much of that all over everywhere; do we have to go out of our way to wipe out all remaining vestiges of well-built buildings that remain? That clubhouse has stood there for barely 75 years—it is just getting warmed up! All it needs is a little respect and responsible maintenance, and it will outlast and outperform whatever they build new. George Robertson is a Beacon Hill resident of more than twenty years, an architect, an artist, an occasional writer of often incendiary rants that annoy the neighbors, and a daily user of Jefferson Park. Seattle City Councilmember Sally Bagshaw spoke at the recent Neighborhood Greenways meeting at the Beacon Hill Library. Photo by Dan Bennett. By the end of 2012 Beacon Hill residents will be able to safely walk or bike from the Mountains to Sound Trail to Georgetown on a quiet and safe residential street optimized for non-vehicular traffic. First presented in the Beacon Hill Family Bicycle and Pedestrian Circulation Plan, this signed route (mapped here) will include safe arterial crossings at Beacon, Spokane, and Columbian, as well as pavement markings, tree planting, and other safety improvements. The 3-mile route connects six schools (Cleveland, Maple, St. George, Thurgood Marshall, Asa Mercer, and Washington), three major parks (Maple, Jefferson, Judkins), the library, and our business district with a pleasant safe street for you and your family to walk or bike along (of course, cars are still welcome for local residents). At a January 10 meeting of Seattle Greenway Organizers at the Beacon Hill Library, Seattle City Councilmember Sally Bagshaw enthusiastically announced a set of pilot Neighborhood Greenways being planned by the Seattle Department of Transportation (SDOT) that are designed to make streets safer and more pleasant for people who live, walk, bike, and drive in Seattle’s neighborhoods. The Neighborhood Greenways under review total 11 miles: seven miles in Ballard, Beacon Hill, Greenwood, North Delridge, Wallingford, and the University District and an additional four miles in Laurelhurst (funded by Seattle Children’s Hospital). These projects are intended to form the backbone of a new network of Greenways that effectively connect people to the places they want to go by giving them a choice to travel on quieter, safer streets around the city. Signs mark directions on the Neighborhood Greenway at 18th Ave. S. and S. Forest St. Photo by Dylan Ahearn. Councilmember Bagshaw, chairing the newly formed Seattle City Council’s Parks and Neighborhoods Committee, is excited to include Neighborhood Greenways on her agenda. “Greenways connect parks and schools, community centers and neighborhood business districts. 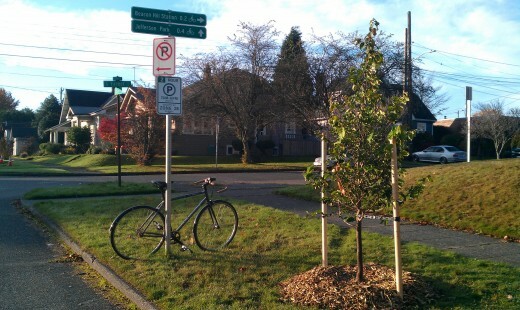 Neighborhood Greenways help with transportation, and they help with getting people where they want to go within their own communities.” (Watch a YouTube video of Councilmember Bagshaw’s announcement here.) Councilmember Bagshaw and Councilmember Tom Rasmussen, who chairs the Seattle Transportation Committee, have taken great leadership initiative on Greenways. In case you missed previous posts here and here: Neighborhood Greenways are slow-speed, low-traffic residential streets made even more pleasant for the people who live, walk, and bike on them. By adding new park-like amenities and limiting cut-through traffic, Greenways are naturally attractive both for families, and for anyone seeking a safer, more connected community experience. By placing Greenways a block or two away from major arterials, Neighborhood Greenways create a great option for people who prefer to walk or bike away from congested streets. 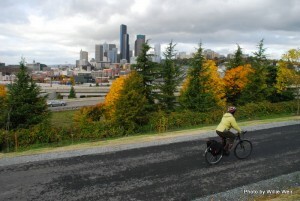 While many new dedicated walking and bicycling trails are beyond the reach of our City’s budget, 10 miles of Greenways can be built for the cost of a single mile of new trail, offering the potential to bring a high-quality network to all Seattle neighborhoods at a comparatively low cost. Neighborhood access by emergency service vehicles and freight delivery vehicles—and parking—is preserved along Greenways. If you would like to get involved with Greenway planning on Beacon Hill during these exciting times please visit the Beacon BIKES webpage and come to our February meeting! Bassetti Architects is designing a new golf clubhouse in historic Jefferson Park on Beacon Hill. The project is funded through City bonds. In a meeting on December 15 to discuss the plans, participants were left wondering: who is Bassetti designing the new golf facilities for? The 1936 golf course clubhouse building. Photo by Mark Holland. Local golfers are unhappy that the first hole on the short-nine course will be eliminated to build a parking lot. Golfers also don’t like the loss of the historic putting greens to a replacement that is only 60% of the size. There will be no more men’s and women’s locker rooms at this historic municipal facility. Instead, the operator, Premier Golf, will get a big banquet room that they can rent out. Exactly how the new facility will be run and who will get to access to spectacular views from the driving range, second floor balcony, banquet room, and new restaurant will all be left up to the private contractor to decide in the future. The current clubhouse was built by the WPA in 1936. The golf community in Southeast Seattle calls Jefferson its home course and they are proud of the history of its diverse membership and activities, including teaching youth how to golf. The building, landscaping, and putting greens all reflect the Olmsted design and are a strong reminder of the history of the place. 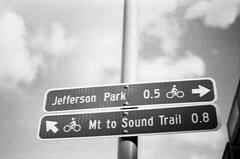 Recently reconstructed, Jefferson Park itself features Olmsted style curved pathways and many other nods to its history. The new clubhouse design boasts green engineering (if they can afford to build it), 50 driving range stalls, better lighting, and a new restaurant. It also features boxy modern design, and strong angular walkways, reminiscent of a suburban office park. The overall impact of the two-story facility is very much out of character with the historic setting and important functional features are lost. Attendants of the meeting voiced these concerns. They were less impressed with trendy green features (rain gardens, passive HVAC, potential solar power generation and water collection systems) and more concerned about preserving functional pieces, like the historic putting greens, pedestrian paths, trees, and the nine-hole golf course. 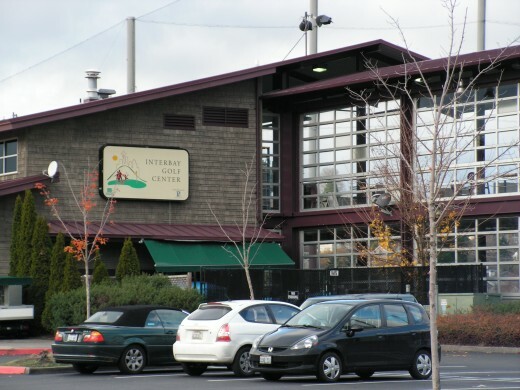 The Interbay golf course clubhouse, of similar size and scale to the planned new clubhouse at Jefferson Park. Photo by Mark Holland. It seems clear that the project is not being designed for the local golf community at Jefferson but for the private operator who hopes to bring in more money from people with deeper pockets than the south end neighbors. Putting greens don’t generate revenue for the operator and the nine-hole probably doesn’t contribute either. This explains the lack of emphasis on the historically important putting greens and nine-hole where kids and amateurs alike learn to use a club and the elders can gather, sit on the bench, and place side bets on the action. There is too much parking lot in the design, which makes one think perhaps the private vendor anticipates a revenue source there in the future. Range Rover parked on pathway near the clubhouse. Parks plans to cut down three trees here and move the fence and pathway to install six parking spaces right where this SUV is parked. Photo by Mark Holland. This design needs to be less about Premier Golf and Parks Department fanciful dreams of generating greater revenues by glitzing up municipal golf courses on the surface. It needs to be more about the Jefferson Park golf community, the history of the facility, integration with the surrounding park, maintaining functionality, and issues of longevity (including decrepit maintenance facilities visible inside the new park and completely unaddressed in this very expensive project). There are many potential benefits of improving the Jefferson golf course facilities but this design is not endearing. Bassetti will not be producing an acclaimed facility if they recommend spending money on gimmicks like expensive solar collectors over building better putting greens. They won’t be applauded for removing locker rooms and replacing them with private banquet facilities, nor for bringing in tourists and failing to keep the local golfers on the home course. Frederica Merrell was the North Beacon Hill neighborhood planning co-chair from 1998-2000, and is the co-author of Seattle’s Beacon Hill, featured in the sidebar of this very blog. New wayfinding signage like this is found on the new Beacon Hill Greenway. Photo by kashgroves in the Beacon Hill Blog photo pool on Flickr. We at Beacon B.I.K.E.S. (Better Infrastructure Keeping Everyone Safe) love us some Neighborhood Greenways. What are Neighborhood Greenways, you may ask? Neighborhood Greenways are quiet residential streets that are optimized for pedestrian and bicycle travel. The idea is to have routes that connect our neighborhood to itself along streets that are safe for those 8 to 80 years old. The bike lanes on the arterials are only going to be used by a small minority of the neighborhood; Neighborhood Greenways, on the other hand, can be conformably used by anyone! What does a Neighborhood Greenway look like? The best introduction to Neighborhood Greenways is this video from Portland. Basically, a residential street that connects neighborhood destinations is outfitted with wayfinding signs, paint markings on the street (like the “sharrows” on 15th), some traffic calming (speed bumps, traffic circles), improved crossing treatments at intersections with arterials, and maybe some trees to spruce the place up. The result is a street that gives that small town feel in the middle of the big city. Traffic is calmed where people want it calmed (in front of their homes! ), bikers are off the arterials where conflicts with traffic are good for no one, use of the public space provides more eyes on the street and thus reduces the likelihood of crime, and you can bike to the park or to school with your kid without worrying for their lives. The Beacon Hill Family Bicycle and Pedestrian Circulation Plan is basically a big network of Neighborhood Greenways on Beacon Hill. The first Greenway route (18th Ave South/17th/Lafayette) is currently being implemented. The wayfinding signs are up (you may have seen them around the library), the paint will be going in within a month, and as of yesterday SDOT planted about 70 trees along the route. I snapped some photos this morning of our new friends on the hill. Its not a Greenway without the Green, so we are excited that the city agreed to help us out with the trees! Neighbors along the route with a spot for a potential tree in their planting strip were offered a choice of a couple different species of trees or no tree at all. SDOT planted and will water the trees for 3 years until they are established. SDOT will also prune for the life of the trees. The trees planted were paperbark maples, Persian ironwood, “Royal Raindrops” crabapples, “Native Flame” American hornbeam, and “Emerald Sunshine” elm. If you get the chance, take a stroll down 18th and see how our first Greenway is coming together! Next Beacon B.I.K.E.S. meeting is Wednesday November 16th, 6-8pm at the library. All are welcome! Amazing views greet cyclists on the Mountains-to-Sound Trail. Photo by Willie Weir. Recently ribbons were cut and speeches were made at the opening of the new segment of the Mountains-to-Sound Trail. Any additional trail miles that provide needed access for bikes and pedestrians is cause for celebration. Except that the Mountains-to-Sound Trail now officially ends at a blind corner of a very steep hill. Holgate, which rises to and descends from Beacon Hill, is legendary on this side of the city. It is the type of road that even some seasoned cyclists choose to avoid. If you are descending it from the top of Beacon Hill, you can easily hit 40mph without a single pedal stroke. You just take the lane and fly. The road crosses I-5, and at this point as a cyclist, you need to be hyper-aware as you dump out onto the left lane of traffic. Cars turning from Airport Way S. are speeding to make the light at 6th Ave. S. Many motorists like to make a left hand turn across your path as they exit the Office Depot. And the road surface is a photo op for the “repave our streets” campaign. On the way up Holgate you are in a narrow lane with a high curb on your right as you climb over I-5. The thought that a car clipping you could send you catapulting onto the freeway is enough to have many cyclists choose to ride on the left hand sidewalk and then cross over at the blind corner as the sidewalk ends. Sounds fun, doesn’t it? Can you imagine parents riding their bikes along with their two young kids tackling any or all of this? It sounds rather nightmarish. And yet it is a possibility. The Mountains-to-Sound Trail is a separated recreational path. The type of trail that is desirable for riders and walkers who aren’t comfortable in traffic. The recently opened extension expands the trail from 12th Ave. S. to Holgate. The path is a delight and offers beautiful vistas of downtown Seattle. I had a hard time wiping the grin off my face the first time I rode it. 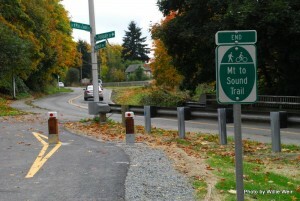 The end of the Mountains to Sound Trail at the blind corner of Holgate and Beacon Ave. S. Photo by Willie Weir. My grin faded at Holgate. The sign simply reads, “End. Mt. to Sound Trail” That’s it. No more information. What is the family with their two kids going to do? They’ll look at the option of crossing the road at the blind intersection and climbing the steep hill to their left. But what’s up there? They don’t know, because they are visiting from Spokane or Missoula and they don’t know that at the top is the business district of Beacon Hill with a light rail station, bus connections, stores, restaurants, a library, and a huge park. No, to them it’s just a big scary hill to destinations unknown. Then they’ll look down the hill and think, “The Sound is that way.” They’ll opt to walk their bikes down the sidewalk because the hill is steep and their kids are scared. This is good. 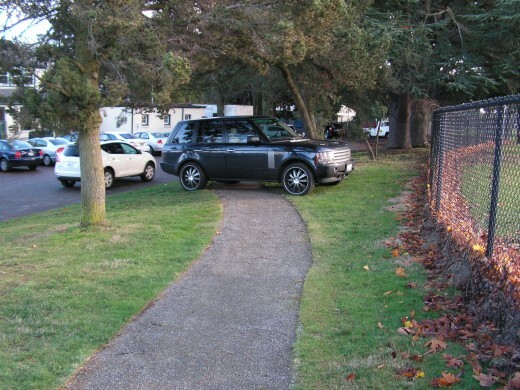 Because that sidewalk ends in a flight of stairs. To their credit, SDOT has posted a sign regarding this about 200 feet before impact. The sidewalk down Holgate quickly becomes a stairway, dangerous for bikes. Photo by Willie Weir. Now our visiting family is stuck. Because to continue forward means having to lift their bikes onto a narrow road with speeding traffic and “take the lane, kids.” Beyond this dangerous move there is no signage letting them know that they are three blocks away from the bike path that runs parallel to light rail. But I’m guessing at this point our family will opt to turn around and push their bikes back up the sidewalk. The kids will be crying and Mom and Dad will think, “This is unsafe and crazy.” They will finally reach the trail and backtrack from whence they came. What the family doesn’t know is that the Mountains-to-Sound Trail will eventually be completed. There will be a switchback trail that crosses under the freeway and connects to the bike trail and light rail station at Royal Brougham. But construction of that section isn’t even scheduled yet… so it’s years away. In the meantime, information needs to be posted that gives everyone an option. Experienced city traffic cyclists can take a right at Holgate and shoot into the Sodo District or take a cautious left and climb to the Beacon Hill business district. Others can backtrack and follow the bike route signs to downtown, or be routed that way to begin with. The dangerous conditions at the blind curve where Holgate becomes Beacon Ave. S. need to be addressed. This is now more important than ever! This is one of the few accessible routes up to Beacon Hill and it should be made safe for everyone. The Mountain-to-Sound Trail extension is great! It will be better when it is finished (South Seattle’s missing link?). But until then, we need signage that explains the current conditions, and improvements that give everyone safe options. Without them, the ride doesn’t end well. Biking on Beacon: Why did the neighbor cross the road? …To get to our brand new park! Jefferson Park is a wonderful community gathering space located in the heart of Beacon Hill. It offers amazing views, brand new tennis courts, playground, cricket, lawn bowling, golfing, a community center, and soon we will have a skate park and spray pad (which would not have gotten much use this summer, somewhat diminishing the sting of construction delays). But the irony is this community nexus acts as a physical division within our neighborhood. 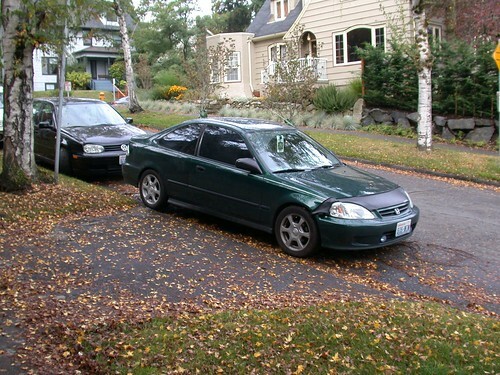 The golf course is not permeable by car or foot, while the park is surrounded by arterial and collector streets (Spokane, Columbian, Beacon) that are wide and unsafe to cross except at stoplight-controlled intersections. Due to the current configuration it is difficult to access the park in a safe and efficient manner without getting in your car and driving there, which I must say, though I love my car, does take the neighborhoodiness out of things a bit—when was the last time you had a meaningful interaction with a neighbor when driving past them on 15th? Neighbors have noticed that many people try to access the park by foot by crossing Spokane between Beacon and 15th Ave. S. (at 16th, 17th, Lafayette, and Alamo). Though legal, crossing Spokane at these intersections across 4 lanes of fast-moving traffic with no marked crosswalks and difficult sightlines is not the most relaxing stroll to the park. A solution proposed in Beacon Hill’s Bike and Pedestrian Circulation Plan is to create a safe pedestrian crossing at Lafayette Ave. S. The first step to adding a new pedestrian crossing is data collection. Within the past month folks from Beacon B.I.K.E.S. have conducted pedestrian crossing counts and even shot a nice video at the proposed crossing. The results from the counts indicate that during peak hours around 20 people per hour will cross Spokane at these dangerous intersections. This is considered a high enough rate by SDOT to justify a pedestrian crossing. 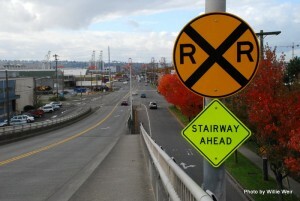 SDOT will soon be conducting their own counts and studies and hopefully we will get the crossing installed next year! Of couhttp://youtu.be/dvqw7D8-6aYrse, it won’t happen without a lot of community support, so if you are interested please contactBeacon B.I.K.E.S. and send an email to Peter Hahn (SDOT director) letting him know this is something the neighborhood needs. For the 2011-2012 school year, the cash-strapped Seattle Public Schools Transportation Department has come up with a plan designed to cut costs while still providing school bus service to many students. A primary part of this plan consists of consolidating multiple stops into central locations designated as “Community Bus Stops.” An FAQ on the SPS site (PDF) describes how Community Bus Stops will work. Q. My transportation eligibility is “Community Bus Stop.” What does that mean? A. Community Stops are located at or near your neighborhood school and within the walk zone of the school. This could require up to a one mile walk. If you do not live in a walk zone for an elementary or K‐8 school, the bus stop will be at a regular neighborhood stop and could require a walk of up to a half a mile. If you live within a half a mile of the regular transportation zone, you can apply for space available transportation and walk to a corner stop within the zone. For my family, this will mean traveling a half mile to the Beacon Hill International School so my son can catch the school bus that used to pick him up across the street from our house. Sure, it’s an inconvenience, but I’m well aware of the financial problems the district is facing and while I hope they get their house in order, I’d rather they make cuts to bus service than to educational programs. To provide efficient public transportation, Metro Transit and Sound Transit have coordinated their services so that they converge in one spot. From this one location on Beacon Avenue, mass transit riders can board bus routes 36, 38 and 60, or take the elevator to the light rail platform and board a train. What they won’t be able to do under the new Seattle School District transportation plan is see their child safely onto a school bus and then easily board a Light Rail train or a number 38 bus. Instead, parents of children assigned to the Beacon Hill International School bus stop will find themselves half a mile from our neighborhood’s existing Community Bus Stop for the entire community. The School District is suffering from terrible reputation problems, fueled by highly publicized scandals and an impression of lax oversight and poor responsiveness to community needs. I would suggest that a step towards restoring the district’s reputation and better fulfilling its mission could include aligning its transportation services with the services offered by Metro and Sound Transit. Effective education means understanding the needs of families, not just the children in those families, and making choices that better help working parents better juggle getting their kids to school, themselves to work, and everyone safely back home would be an indicator that the Seattle School District understands this. As a practical matter, school buses can’t block the Metro bus stops on Beacon Avenue. However, they could conceivably stop on Roberto Maestas Festival Street, 16th Avenue, or even on the other side of the block on 17th Avenue across the Festival Street from where a school bus stopped at the El Centro de la Raza driveway all last school year. What matters less than these details is that the stop would be near a real Community Bus Stop that already meets the transportation needs of many families. The School District projects an image of a out-of-touch bureaucracy that plans in isolation and is incapable of managing its affairs. Aligning school bus stops with Metro and Sound Transit’s regional transportation plans won’t change this perception overnight, but it could help demonstrate an awareness of the need to work better with the communities the District serves. While on vacation last week I sent an email to the Seattle School District Transportation Department proposing this idea. This week I’m going to follow up by emailing the School Board and both emailing and calling the office of School Board member Betty Patu, who represents the Southeast District, linking to this post and asking that they please consider this idea. This past Sunday morning my son and his roommates who live in a house near the corner of Beacon Avenue and Columbian Way were the victims of an attempted home invasion. Around 5 a.m. Sunday morning a car load of five Asian young men drove up to their house and began trying to break in their door and get in to the house. My son and his two roommates woke up and were alarmed by the noise, grabbed baseball bats to prepare for the worst. As the intruders banged on the door and broke a window, they called 911 and the police responded in five minutes. The car left before the police arrived, they were left shaken. The police took their report and said they could only report it as a property damage crime. They were able to identify the car, but not the plates, and had descriptions of some of the intruders. This is criminal to me. Things could have gone so much worse, and could have possibly ended in tragedy. Is there any one that they might be able to connect with on Beacon Hill that could help them? Someone in the Police Department? City? An attempted home invasion should not be taken lightly, but the police seem not to care. I’m at a loss as to who they can turn to for help. Any direction would be welcome since they love living on Beacon Hill, but are ready to move because they no longer feel safe.